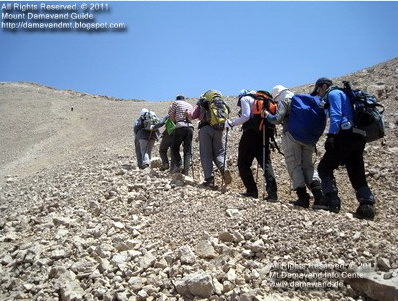 Helpful information for Climbing and Trekking Damavand Iran. To enjoy a safe hike to Mt. Damavand summit, it is essential to bring the proper equipments. Always bring enough gears to protect yourself in case of bad weather. Depending to the weather on the summit day, you can decide which equipments you need to take with you and which unnecessary gears to leave behind at camp3 Bargah Sevom. Some of the most important things to bring are listed below. See also Damavand Equipment List FAQ. When you apply for a tour, some gears are provided by your tour operator. Just bring your personal equipments. - Earplug, to block undesirable noises which may disrupt your sleep in shelter/hut. - Warm Jacket and pants (rain/snow/wind). Visit also Damavand Weather Forcast. - Main backpack (plus a small attacking backpack). - Ski or trekking poles (stick). - Hat, warm pile/wool hat (better to cover ears), balaclava, baseball cap, scarf. - Glacier/Sun glasses with Side Covers 100% UV, IR. - Sunscreen cream SPF 40 or better. - Small personal first-aid kit. - Sleeping bag (bring lining). - Trekking shoes and Socks. - Sleeping bag, mattress, tent. - Jacket ans pants (Gore-Tex or Synthetic rain/snow/wind). - Main backpack plus a small attacking backpack. - Gloves (Polar or Wool with liner). - Hat, warm pile/wool hat (should cover ears), balaclava, baseball cap, scarf. - Water Bottles (and Purification tablets). This is a helpful equipment list for a summer climb to Mt. Damavand, you are not required to bring everything on this list , there are a lot of options, brands, and versions of each piece of equipment, use your experience to find the best gear. Remember the size and the weight is important. Optional - GPS, Compass, Altimeter. Helpful to find out your way. Mobile Phone, Mp3 Player, whistle. Medium size Swiss Army knife, (Keep the knife simple). Ski or trekking poles. Helpful for balance when carrying a heavy pack or if you have knee problems. We recommend a small instant or point and shoot cameras, ie simple and light digital cameras. Headlamp Sugg:LED Petzl, ie MYO XP or better. The rocky, steep terrain in some sections and the potential of sudden, strong wind gusts are reasons to bring proper hiking shoes. Light hiking boots or trekking shoes: Lightweight, high comfort. Avoid tight fit with heavy socks. Comfort is key in buying boots. Spend a little extra time walking around the store or take them home and wear them around your house to make sure that it fits right. A little big is always better than a little small. Make sure your gaiters fit around the boot without being to tight around the boot. Heavyweight wool or synthetic socks (wool is warmer) to be worn over the liner socks. When layering socks, check fit over feet and inside boots. It is very important to buy new socks regularly as they lose their cushioning over time. Smooth thin wool, nylon to be worn next to the skin. This reduces the incidence of blisters and hotspots and helps the outer sock last longer before needing to be changed. They should fit well with your heavyweight socks. Bring proper protection against low temperatures and strong winds of damavand. It is usually below zero at the summit, and strong winds often make it seem even colder. Bring wind gear, as weather conditions can change very quickly. Gloves are recommended both against the coldness and for hiking the steep, rocky passages. Lightweight Underwear, tops & bottoms, other synthetic or wool. Lightweight is preferable as it is more versatile (worn single layer in warmer conditions and double layer for colder). Zip-T-neck tops allow more ventilation options. One white top for intense sunny days on the glacier and one dark top for faster drying gives the most versatility. Expedition weight underwear top or fleece vest. For extra warmth.Fleece/Synthetic jacket. Mid- to Heavyweight pile (Polartec 200-300 depending upon cold tolerance). A full-zip version is easier to put on and has better ventilation than a pullover. Fleece/Synthetic pants. Midweight pile (Polartec 200) with full separating side zippers (This is very important for ventilation and for ease of dressing up or down when conditions change in the middle of a climb). Down or Synthetic Jacket. A warm jacket with attached hood. It can be very cold high on the mountain. Gore-Tex or Synthetic rain/snow shell pants & shell jacket with hood. For the jacket we highly recommend a full front zipper, a roomy rather than snug fit and underarm zips which go well below the armpit. We also require full separating side zippers on the pants. Synthetic gloves. Bunting or fleece gloves which will fit comfortably inside mitts. A heavier fleece will do a better job of keeping hands warmer when wet than lighter polypropylene. Shell Mitts w/ single liner. Seam Taped, GoreTex. We recommend that your mitts do not have a smooth or slippery palm surface. Make sure that you can fit one of your gloves inside the mitten with the shell over the top, three layers total. Balaclava. Look for a simple lightweight model. Baseball cap or other sun hat. One with a good visor to shade the nose and eyes. Synthetic is nice as it dries quickly. Glacier glasses with Side Covers. Regular sunglasses are usually not sufficient. 100% UV, IR, high quality optical lenses designed for mountain use, must have side covers, leashes, and a nose guard is particularly helpful. No more than 8% light transmission. If you wear contact lenses we recommend packing a spare pair of glasses—it is a good idea to have these with “photo-gray” or equivalent light-sensitive material so they can double as emergency sunglasses. If you wear glasses we recommend prescription glacier glasses (gray or amber). Bandana. Used to shade your neck. Main Backpack. (Internal frame pack) expandable to a minimum of 5,500-6,000 cu.in. Keep it simple and light, avoid unnecessary things which add weight. Sleeping Bag. High quality with hood to at least -10C . If you sleep cold bring a warmer bag. Goose down preferred over synthetic for bulk & weight. If well-cared-for, a down bag will last much longer than a synthetic bag. It should be roomy enough for comfortable sleeping but snug enough for efficient heat retention. Optional-Compression stuff sack. Necessary to reduce volume when packing a sleeping bag. Optional-One Self-Inflating Pad. One 3/4 or full length. If you are over 6’ a long is recommended. Make sure to include a valve stem and patch repair kit for your Therma-Rest. One Closed-Cell foam pad. Full length closed cell is recommended. Cooking gear:Cup: 12-16oz. plastic insulated mug with snap-on lid (retains heat well and is spill-resistant in the tent).Spoon: Good quality tough plastic (lexan). You do not need a plastic knife and fork.Bowl: Deep plastic with 2-3 cup capacity. Recommended: Tupperware 3 cup bowl. Small personal first-aid kit. (Simple and Light) Aspirin (Extra Strength Excedrin is best), Antibiotic ointment, Moleskin, molefoam,waterproof first-aid tape, athletic tape, Band-Aids, personal prescriptions, etc. The guides will have extensive first-aid kits, so leave anything extra behind. Please let your guide know about any medical issues before the climb. Sunscreen. SPF 40 or better, small tubes. Make sure that the sun screen is not older than 6 months. Sunscreen older than six months loses half of its SPF rating. Lipscreen. SPF 30 . Not older than 6 months. Water Bottles: 1.5 liters minimum capacity.Purification tablets. Toiletry bag. Include tolielt paper. Purell or other alcohol handsanitizer, toothbrush, toothpaste , deodorant. Optional-2 Trash Compactor bags. To line stuff sacks to keep gear dry. Trash Compactor bags are made from a heavier plastic. For Women-Long lightweight over-coat. Long sleeves and length below knee worn over jeans, other pants or a long skirt.- Head Scarf. To be worn tied under chin to cover hair, head and neck. For Men- Long sleeved shirts and long pants. Requested by costoms of mondesty, shorts are not recommended. Tee-shirts may be worn while trekking/climbing. Alothough I do not suggest you hike damavand during nighttime, a flash light is highly recommended in any season and essential outside of the peak season. Most people choose head lamps, as they leave both of your hands free. Particularly on the trails like mount damavand where there are few mountain huts, it is important to bring enough water and food. Also, it is a good idea to carry down all your garbage although there are garbage bins on Damavand south route. Mt Damavand winter climb can be dangerous and risky, info in this post is based on our experiences and compared to a number of reliable sources and is provided here for educational use only. When climbing in cold weather and winter conditions it is your responsibility to have the proper knowledge, experience, and equipment to travel safely. Plan your pack neatly so that it takes a little time to get anything out, extra clothing should be quickly accessible, all clothing must be clean, nonfreezing laces on boot, defog all glasses and goggles. The info in this article may not be the most current and up to date. - Wind Jacket with Hood - 60/40, nylon, Goretex-will double as rain jacket. - Wind Pants - nylon (Goretex-doubles as rain pants). - Glacier or Ski Goggles with side screens. - Rain Pants - nylon, Goretex - must fit over stacked layers. - Crampons with binding and point protectors. - Plastic Spoon - should be tied to cup. - 1-2 brad per day. - How will you organize glasses & face mask & balaclava ? - Will your shell go over pile, over polypro, over water bottles, over body? - Can you get wind/rainpants on with boots on, snowshoes? - Can you get gaiters on with boots on? Getriebe Liste für Damavand Iran. Ausrüstungsliste für Wanderungen und Klettertouren zu Damawand. Wesentliche Ausrüstung für Demavand Sommer und Winter. Ausrüstungen für Skitouren und Snowboarden. Ski und Snowboard Abenteuertouren auf Resorts Iranski. Technische Bekleidungs Schutz vor den niedrigen Temperaturen und starken Winden. Snowboarding in Iranski Resorts. Technische Informationen, wie Sie den Berg zu besteigen. Kletterausrüstung und Ausrüstung Liste. Damavend Karte. Low-Budget-Tour in den Iran Demawand. 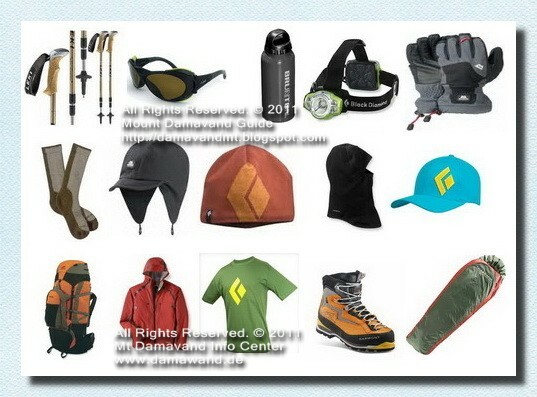 Gear list for Damavand Iran. Equipment list for trekking and climbing tours to Damawand. Essential equipment for Demavand summer and winter. Equipments for skitouring and snowboarding. Ski and snowboard adventure tours to Iranski resorts. Technical clothing protection against low temperatures and strong winds. Snowboarding in Iranski resorts. Technical info for how to climb the mountain. Climbing equipment and gear list. Damavend Map. Low budget tour to demawand iran. Lista de engranaje para Damavand Irán. Lista de equipos para practicar el senderismo y la escalada tours para Damawand. Equipo esencial para Demavand verano e invierno. Equipos para skirando y el snowboard. Ski y tours de snowboard a Iranski resorts. Técnica de protección ropa contra las bajas temperaturas y los fuertes vientos. Snowboard en resorts Iranski. Datos técnicos de cómo subir a la montaña. Equipo de escalada y la lista de cambios. Damavend Mapa. Recorrido de bajo presupuesto para demawand iran. Liste engrenages pour Damavand Iran. Liste des équipements pour la randonnée et d'escalade à Damawand. Équipement essentiel pour Demavand été et d'hiver. Equipements skirando et le snowboard. Ski et de snowboard tours d'aventure pour Iranski stations. Des vêtements de protection technique contre les températures basses et des vents forts. Snowboard dans les stations Iranski. Information technique pour savoir comment gravir la montagne. Matériel d'escalade et la liste engrenage. Damavend Plan. Visite faible budget demawand iran. Lista Gear per Damavand Iran. Elenco delle apparecchiature per il trekking e arrampicate a Damawand. Equipaggiamento essenziale per l'estate e l'inverno Demavand. Attrezzature per sci-alpinismo e lo snowboard. Sci e di snowboard tour avventura di Iranski resort. Protezione Abbigliamento tecnico contro le basse temperature e forti venti. Snowboard in località Iranski. Informazioni tecniche per come scalare la montagna. Strutture d'arrampicata e la lista del cambio. Damavend Map. Tour Low budget a demawand iran. Gear liste for Damavand Iran. Utstyrsliste for trekking og klatreturer til Damawand. Nødvendig utstyr for Demavand sommer og vinter. Utstyr for skitouring og snowboard. Ski og snowboard opplevelsesturer til Iranski skianlegg. Teknisk klær beskyttelse mot lave temperaturer og sterk vind. Snowboard i Iranski skianlegg. Teknisk info for hvordan å klatre i fjellet. Klatreutstyr og utstyr liste. Damavend kart. Lavt budsjett tur til demawand iran. Механизм список для Damavand Ирана. Перечень оборудования для походов и восхождений на Damawand. Необходимое оборудование для Demavand летом и зимой. Оборудование для skitouring и сноуборде. Горные лыжи и сноуборд приключенческие туры в Iranski курорты. Техническая защита одежда от низких температур и сильных ветров. Сноубординг на курортах Iranski. Техническая информация о том, как подняться на гору. Восхождение оборудование и снаряжение список. Damavend Карта. Низкая тур бюджет demawand Иран. Mekhanizm spisok dlya Damavand Irana. Perechen' oborudovaniya dlya pokhodov i voskhozhdeniy na Damawand . Neobkhodimoye oborudovaniye dlya Demavand letom i zimoy. Oborudovaniye dlya skitouring i snouborde . Gornyye lyzhi i snoubord priklyuchencheskiye tury v Iranski kurorty. Tekhnicheskaya zashchita odezhda ot nizkikh temperatur i sil'nykh vetrov. Snoubording na kurortakh Iranski . Tekhnicheskaya informatsiya o tom, kak podnyat'sya na goru . Voskhozhdeniye oborudovaniye i snaryazheniye spisok . Damavend Karta . Nizkaya tur byudzhet demawand Iran.